In honor of Dr. Martin Luther King Jr. and to celebrate his birthday, I am posting a tribute to him that I wrote and distributed on February 2, 2002. I am posting it here today for the same reason as then – to honor Dr. Martin Luther King Jr., and to celebrate his birthday (his exact birthday is January 15). After all, where would we be had Martin Luther King Jr. never been born? Dr. King worked and died for the cause of freedom; he fought to end racism and do away with poverty and war but by peaceful means only, never by violence, even knowing his speaking out for these causes would likely ultimately cost him his life. Dr. King would no doubt agree with humanitarian, environmentalist, and antiwar/nonviolent singer-songwriter Jackson Browne, who says on his newest album “Standing In The Breach”, in the song Walls and Doors : “There can be freedom only when nobody owns it”. Dr. Martin Luther King Jr. was a strong advocate for positive change for all people, especially children. Continued global warming will make the world we all share a much more hostile place for all people, especially today’s children who have a full life ahead of them. It will take a worldwide effort to stop global warming, and we owe it to children everywhere to do all we can before it becomes an irreversible, worldwide catastrophe. My proposal is that we ALL petition our governments (with letters, petition, phone calls…) to reduce greenhouse gas emissions by adopting programs that REWARD PEOPLE AND FAMILIES WHO USE LESS ENERGY – by DRIVING LESS, FLYING LESS and USING LESS fossil fuel derived energy in their HOMES. 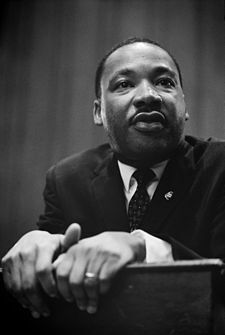 MLK once said: “We are prone to judge success by the index of our salaries or the size of our automobiles, rather than by the quality of our service and relationship to humanity.” We can serve humanity better by consuming less fossil fuel (gasoline, jet fuel, coal, natural gas and oil) by driving less, flying less and using less energy in our homes. Our children and their children will thank us for that.